Now that we know U.K. policymakers are skeptical about the rise in inflation, all signs point to a top for the British pound. Going into this week’s rate decision, many investors believed that the central bank would upgrade its growth and inflation forecasts with Carney recognizing the improvements in the economy. Some even hoped there would be 2 dissents in favor of higher rates but instead, the Bank of England lowered its 2017 GDP forecast and attributed the entire recent pickup in inflation to the weak currency. In his speech, Carney focused on the weakness of household spending and GDP and emphasized that domestic costs and wages remain subdued. The central bank did recognize some of the improvements in the economy but they didn’t want to sound overly optimistic because everything hinges on a smooth Brexit – something very few have confidence in. Sterling remains in focus in the coming week with inflation, employment and retail sales scheduled for release. While we expect most of these reports to surprise to the upside, GBP could still trickle lower as these reports won’t change the central bank’s dovish bias. We like selling GBP vs. the Swiss Franc because USD/CHF is struggling to extend its gains after this past week strong rally. USD/CHF soared after the French election as investors unwound their Le Pen hedge. 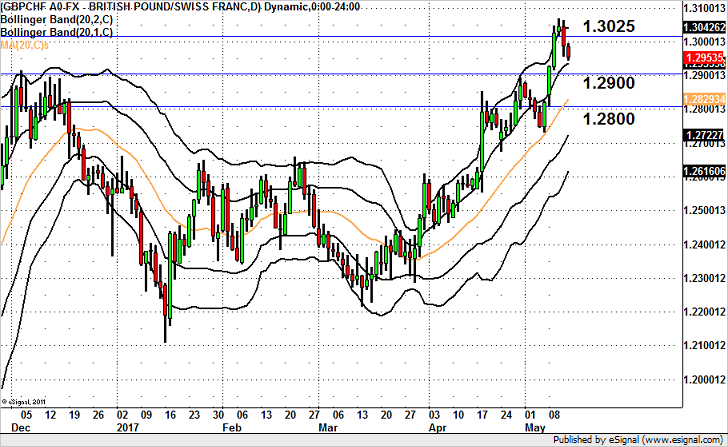 Technically, GBP/CHF has fallen below 1.3000 and now appears poised to test the 20-day SMA at 1.2830. Of course we need to see 1.29, the December high broken before that happens but if this level is breached, GBP/CHF should slip as low as 1.2830. If it rallies back above 1.3025, then new 8 month highs are likely.